Miley Cyrus dug into her Cherokee roots for some tattoo inspiration yet again, revealing a pretty sweet Native American symbol inked on her right arm. The young singer posted a picture of her arm tattoo – which features two crossed arrows inked in black – on Twitter in the early hours of February 1, along with the caption “ratta tat tat @thekatvond.” In the pic, the pop star sports an all-black ensemble, with tight black pants and a black tank with what look like suspenders, her black arrows tattoo completing the punk-rock look. Miley wasn’t the first to spill the beans on the arrows arm tattoo though; celebrity tattoo artist Kat Von D tweeted on January 31, “Loved tattooing Miley Cyrus yestrday [sic]! Simple symbols of friendship make beautiful tattoos. <3” We’re not surprised at all that Miley got another tattoo, we just can’t believe it took her two whole days to post pics of it online! Miley Cyrus’ tattoo is very simple, like many of her other pieces of ink, and is located on the back of her right forearm, just above her elbow. As Kat Von D hints at in her Twitter post, the classy crossed arrows image is actually a Native American symbol for friendship. Native Americans were a deeply spiritual people who traditionally communicated their history, ideas and dreams from generation to generation through signs and symbols, including the very important arrow symbol. In many cases, Native American tribes used the same symbol in varying designs to convey different meanings. For example, a single arrow was considered a symbol of protection or defense, while two arrows pointing in different directions represented war, and a broken arrow symbolized peace. 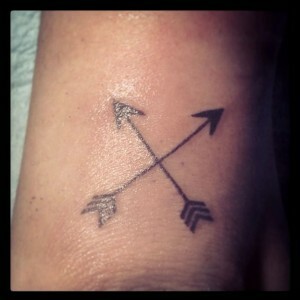 Crossed arrows, like in Miley Cyrus’ arm tat, were used as a symbol of friendship. Who Inspired Miley Cyrus’ Arm Tat? It’s obvious that Miley Cyrus is proud of her heritage, same as her dad, Billy Ray – who has a Native American portrait tattoo on his arm – and her brother, Trace – who has a similar tat inked on his head (yes…his head). The last time Miley Cyrus looked to her Cherokee heritage for some tattoo inspiration, she got a large tattoo of a dreamcatcher inked on her ribcage as a symbol of protection for her four siblings. Many of Miley’s tattoos are influenced by her beliefs (such as her karma and Om tattoos), and many others are inspired by people she cares about, including the Teddy Roosevelt quote tattoo she shares with fiancée and Australian actor, Liam Hemsworth. Do you think that the singer’s crossed arrows tattoo is simply a friendship tat with an important gal pal in her life? Or…could it be that Miley is reminding a certain Hunger Games star who his bow-and-arrow-wielding love is in real life? Stay tuned to find out! Interesting that Miley has covered the often covered Arrows classic 1975 song “I Love Rock N Roll” so now she has not only sung an Arrows song but has an arrow motif inked on her body.